Xbox Game Pass is like Netflix for games. You pay one monthly price and you get access to over 100 games (with new ones added monthly), that you can play 24 hours a day for as long as you want. 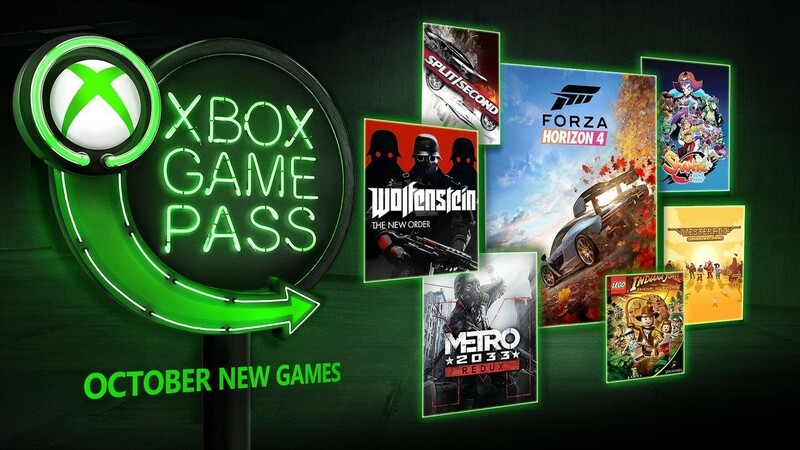 It’s just like other game subscriptions, but Xbox Game Pass isn’t limited to just one publisher — which means you can play a wider variety of titles. TL;DR Version = pay £1.99 to play nearly £1000 worth of games for as long as you want. All of these games join the ever growing Xbox Game Pass catalog in October; and once they’re added, they stay. Play all of these games for as long as you want, and whenever you want– just make sure you have your Game Pass. Pick up your one month pass HERE, or check out the other subscription options HERE. Get Forza Horizon 4 on it’s global release day! While PS4 and PC owners are stuck paying full price, you can enjoy this highly anticipated title for FREE once you have your Game Pass. Forza Horizon is a series where the scenery is almost as gorgeous as the cars… almost! Over 450 different cars will be available in Forza Horizon 4 for you to race, collect, and mod. Speed through beautiful and historic Great Britain solo or online with friends! Wolfenstein 3D basically created what would become the FPS genre back in 1992, and Wolfenstein: The New Order is the modern game that reignited the series. This game is packed with intense, hi-octane, Nazi slaughtering adventure, as you travel across Europe (with the help of resistance fighters) dismantling the evil war machine one piece at a time. And somehow, the developers managed to construct a deep and compelling narrative around all this action as well. Go back in time to this alternate version of the 1960s, and help create the future we deserve! Another extremely well made FPS game, but with a decidedly different tone than Wolfenstein, Metro 2033 Redux takes us to post apocalyptic Moscow– specifically, underground in the ruins of the metro lines. These tunnels have become the only semi-safe place for human kind to struggle to survive, while aboveground a bleak and toxic wasteland festers. But, there is some hope, and it’s your job to try and capture this hope, and help the others survive. Start your journey in this remastered version of the original game (with all the DLC), and find out what awaits you beyond the metro tunnels. Grab your pistol and saddle up, because it’s time for a classic western revenge story. However in this story, you can break the rules, so the plot might not be as predictable. Explore the world, shoot whoever you want, or maybe talk to them instead, it’s up to you if you want to avenge your family by being a saint, or a blood-crazed outlaw. You’ll encounter all kinds of interesting characters on your journey too, many who want to help you, so maybe don’t shoot quite everyone. All of the Lego games are so well made, and this one is no exception. They truly are fun for all ages. Play through the Lego version of all three of the iconic Indiana Jones films, complete with all of the memorable characters (60 in total!). There are puzzles to solve, treasures to find, enemies to fight, and of course: your trusty whip is by your side. It’s time for side-scrolling genie action when a mysterious evil force begins causing mayhem in Sequin Land. You, the Half-Genie Hero named Shantae must use your Belly Dance to change into your final form, or your hair-whip attack to smack some sense into any enemies that dare get in your way. This is a title that both old-school side scrolling fans and newcomers to the genre will enjoy. If you’ve ever wondered what it would be like to be in a Michael Bay film, this game will get you one step closer. You’ve played arcade racing games before, but have you played one within a reality TV show? That’s the premise of Split/Second. It’s an all out war as you race to the finish in a city that’s been build for you to both destroy it AND use it as a weapon to destroy your fellow racers.